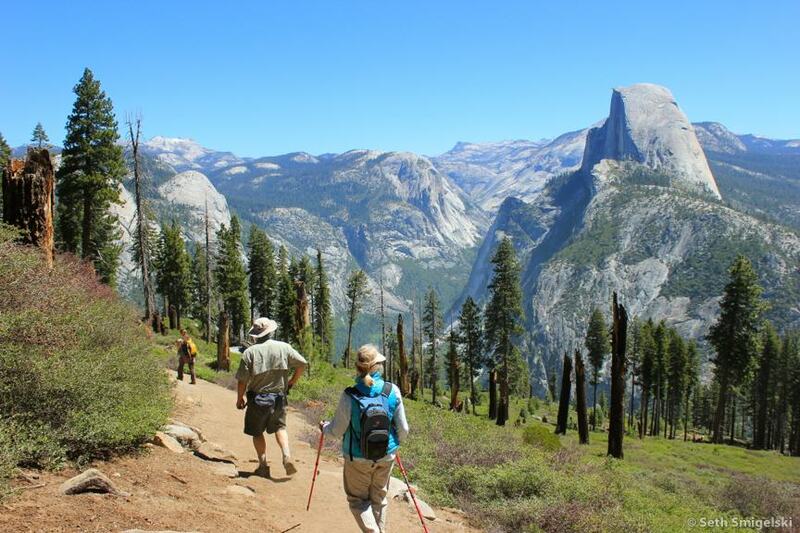 Hiking in the Yosemite National Park can be a fun and rewarding experience as in other national parks. It is a great way to both see and experience the park. Stay on trails: taking shortcuts is dangerous and causes trail erosion. Trails are not maintained nor are they regularly patrolled: travel carefully and at your own risk. There are 840 miles of trails and eight-miles of paved bike path in the Yosemite Valley. Dogs and other pets, bicycles, strollers, and motor vehicles are only permitted on paved trails. Do not hike or snowshoe in Nordic ski tracks. People on snowshoes, should walk alongside, but not in the ski trails. Be aware that ticks may exist in the park. Consult your doctor if you believe you’ve been bitten. High winds, called Mono Winds, sometimes occur in Yosemite and are created by an atmospheric condition which exists along the Sierra Crest. These winds can speed westward down canyons at 50 to 70 miles per hour. While quite rare, this phenomenon occurs more often in Yosemite Valley than any other occupied part of the park, and most frequently during Oct through Mar. Mono Winds can create potential danger from falling trees and may dictate that the National Park Service initiate area closures or evacuations to insure the safety of park visitors and residents. If a closure or evacuations should occur, please follow instructions carefully and stay out of evacuation areas until officially notified that it is safe to return. See horse drawn wagons, walk across a covered bridge, and visit historic buildings out of Yosemite’s past. Take a 30 minute, self-guided tour through the Pioneer Yosemite History Center and learn about people and events of Yosemite. The Center is always open, and explanatory signs and brochures are available. Located adjacent to the Wawona General Store, across the Covered Bridge. Easy walking, except during extreme snow conditions. The Miwok in Yosemite is a short loop trail that winds through a reconstructed Miwok-Paiute Village in the Indian Village of Ahwahnee. It introduces Southern Miwok life, history, and language. The trail begins behind the Yosemite Museum building. A Changing Yosemite is a one mile trail that explores the changes which have led to the Yosemite we experience today. Trail begins near shuttle bus stop #6. At Shuttle Bus Stop #16, Happy Isles and the Nature Center provides family-centered exhibits, and wonderful wheelchair and stroller accessible paths that wind around the rushing Merced River. This is an ideal place for a family outing. The Valley Junior Ranger program operates from the Nature Center during summer months and there are many educational (and interesting!) exhibits in the new Nature Center.